We return to the small town Midwest for a town of under 10,000, famous for being the home of famed "Blue Bunny Ice Cream." Chicago was being represented well here with #2 Spanky & Our Gang's great "Yesterday's Rain" being quite a surprise position. The Archies (Ron Dante) and the Banana Splits share the Saturday morning cartoon band hit parade this time. Three Dog Night begin their career slowly, but in the Midwest are #5 already with their first 45 release. 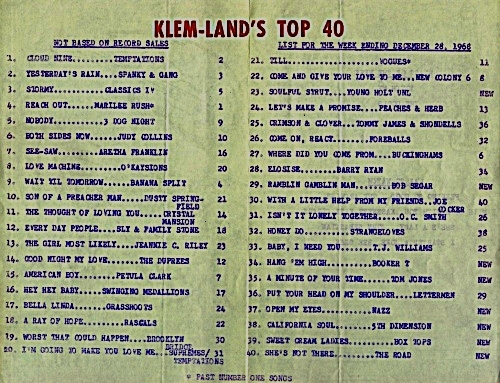 While WLS DJ Larry Lujack was changing plans for the newest New Colony 6 45, the "rocking" side, "Come And Give Your Love To Me,"** was already at #22 in Iowa as well as the Buckinghams' classic "Where Did You Come From," which, if issued a year earlier, would have been top 10 nationally. The fickle public had turned their backs on the group by late 1968, just as they had on producer James Guercio and song writers Beisber / Holvay. One more classic song I cannot go without mentioning is by the Nazz. This Philadelphia band would include future star Todd Rundgren. You may have noticed "Hello It's Me" charting in previous weeks here in FH by the group, but now on KLEM, the true A side, "Open My Eyes" makes it to the chart. To me, this opitimizes great psych pop music of 1968. How THIS never was a hit in 68 and the "B" side was a minor hit in three different years for the Nazz as well as top 10 as a Todd solo 45 later, is beyond me. Both are really great, tho. **By the way, the NC6 45 was a two-sided hit a on the other side of Iowa in Dubuque that very week! 12/26/68: Led Zeppelin kick off their first North American Tour in Denver this evening as the opening act for Vanilla Fudge. The MC5 were also on the bill. 12/30/68 – Peter Tork officially quits The Monkees, buying his way out of his contract for $160,000 and leaving him broke. He will rejoin the band in 1986 after MTV begins airing old episodes of their television series … and has performed with them again on nearly every reunion tour ever since. 12/31/68 - Music trade magazines report that 1968 was the first year that album product outsold the 45rpm unit. Well, we did it ... made our way thru 1968 hitting every single state in the union ... plus Washington, D.C. and Canada. Thanks also to all the faithful fans who visited this page each and every Saturday ... it truly is appreciated. The Top 40 Surveys of yesteryear seem to be a popular item here in Forgotten Hits so we will be looking for ways to feature them on an on-going basis in the future, too. 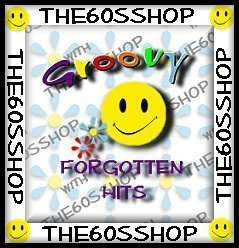 Thanks again to everyone for your continued support as we begin Year 20 of Forgotten Hits. Happiest Holiday Wishes to all of you! (These guys had all four of their singles make The Top 68 of '68 Countdown ... incredible for a start-up group. Although they never had a #1 Record in Billboard, they topped the charts in both Cash Box and Record World with their hits "Young Girl" and "Lady Willpower" ... and "Woman Woman," "Over You" and next year's "This Girl Is A Woman Now" all made The Top Five. Archie was over in Viet Nam when his record went all the way to #1 here in The States. But that didn't prevent a bunch of fake Archie Bell and the Drells groups from springing up and booking shows (and taking credit!) in his absence! Ah yes ... the underbelly of rock and roll. Jeannie scored her only Top 40 Pop Hit with this novelty smash that raced up the chart to #1 and then disappeared nearly as quickly. A huge soundtrack hit for the duo, thanks to the Dustin Hoffman - Anne Bancroft movie hit "The Graduate." This guy kept pace with The Beatles when it came to hit albums ... all instrumental hits with a hint of South Of The Border flavor ... but he never hit #1 on Billboard's Hot 100 Pop Singles Chart until he SANG a tune ... and this one was an absolute smash, topping the charts for four weeks in all three major trade publications. The Young Rascals were "all growed up" by 1968 ... and much more politically aware. Their hit "A Beautiful Morning" (sort of a 'kissin' cousin to their previous chart-topper "Groovin'" from last year) also made The Top 68 of '68 ... but this is the one that would go on to become the biggest hit of their career. One of the more baffling hits on the 1968 charts. Released several months after Otis' death, it became a pop and soul standard immediately upon its release ... yet never hit #1 in either Cash Box or Record World. The baffling part comes from the fact that it held down the #1 position in Billboard for four straight weeks. That one has just never made sense to me. The higher we climb, the bigger they get ... and this one was an absolute MONSTER. And then, nearly just as quickly as it won over the hearts of the kids and parents alike, the public turned on poor "Honey" and it's been considered one of the sappiest songs of all time ever since. (But not before it reached #1 in all three trades ... and stayed there for five weeks. We've told you again and again about the "anything goes" '60s ... and here is yet another perfect example. Looking at a year-end, biggest hits chart that contains the heavy sounds of "Jumpin' Jack Flash" by The Rolling Stones, "Fire" by The Crazy World of Arthur Brown, "Sunshine Of Your Love" and "White Room" by Cream, "Born To Be Wild" and "Magic Carpet Ride" by Steppenwolf, "Hello, I Love You" by The Doors, "Dance To The Music" by Sly and the Family Stone, "Hurdy Gurdy Man" by Donovan and "Hush" by Deep Purple, Frenchman Paul Mauriat and his classical harpsichord becomes the second biggest hit of the entire year! Was there ever any doubt? Topping Billboard's Hot 100 Pop Singles Chart for nine straight weeks it was, hands down, the biggest hit of The Beatles' entire career ... an especially proud feat since it was also their very first release for their very own record label, Apple Records. As we reach The Top 20! The Top Ten Hits of 1968! The concept revolves around the old WABC Top 77 Year-End Survey ... but this countdown is SO much more than that. Tune in to Rewound Radio from now until New Year's Day ... and be prepared to be blown away. Also hosting a countdown this Friday Night will be long-time FH Reader and contributor Ken Freck, who co-authored the "Milwaukee's Radio Chart Hits" book, featuring a list of every record to hit Milwaukee's WRIT Radio Station Survey from 1960 - 1974. This week he'll be counting down (along with Dewey Gill) the Biggest Hits of 1968 ... which is exactly what WE'VE been doing all week long ... on Dewey's Corner on WMSE, starting at 6 pm Central Time on Friday Night. (The shows are also archived so you can listen later if you miss it.) And, as Ken always stresses, "We Play Records."